One hundred crave-worthy recipes—for Gilmore Girls fans who can’t get enough! In the first Eat Like a Gilmore book, fans of the Gilmore Girls were treated to 100 recipes for the decadent, delicious, and comforting foods that fueled the science-defying metabolisms of Lorelai and Rory Gilmore. But that was only a tease. Now fans can make all those other foods that they crave every time they watch an episode: things like pizza, Chinese food, pop tarts, and pies! Here are more favorites from Luke’s diner menu, Sookie’s eclectic inn fare, and Emily’s fancy Friday Night Dinners . . . plus Korean “health” foods, soda shop favorites, foods for wallowing, and hangover survival food. 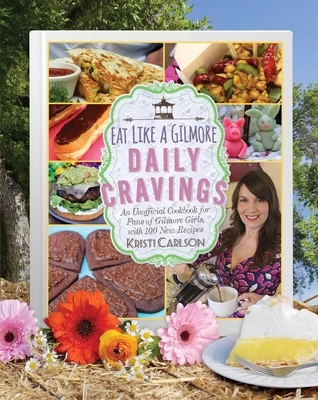 With beautiful photos, helpful kitchen tips, and fun tidbits about the show, Eat Like a Gilmore: Daily Cravings is a must-have for any Gilmore Girls fan. Easy-to-follow recipes make it possible to cook and eat your way through Stars Hollow—and satisfy your own cravings!